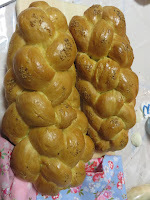 The two Shavuot loaves really seemed alive during the Feast days. They were waved, offered, eaten. 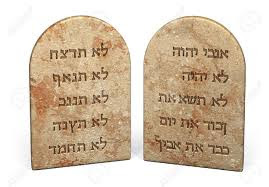 We had an after dinner reading of the Ten Commandments, and some related verses in Exodus and Deuteronomy. After that we noticed even how the loaves resemble the shapes of the tablets of the Ten Commandments! For a nice article on First Fruits Challah, and the quality of how the challah is `alive` when we make it for this special day and for all Shabbatot, step over to this link, HERE! Shabbat Rose, Song of Songs, Shabbat Shalom!